Thanks for sharing these titles. I love finding little-known stories by beloved authors. I really love Alice Dalgliesh and would love to read the two books you reviewed! I am just like you and prefer happy situations and people who get along well in the books I read for myself or to my kids. 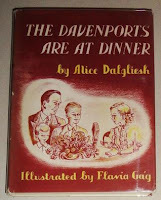 I would like to recommend two other books by Dalgliesh that I read on Open Library - The Silver Pencil and Along Janet's Road..they are more YA type books, about a young lady growing up and finding her way in the world, and they have warm, friendly characters and good life situations. I really loved them and felt I knew the characters by the end. Just found your blog and love the reviews! Thanks for taking the time to write them..